Though all days in the Tamil month Margazhi are important, 'Vaikunta Ekadashi' and 'Koodaraivalli' have more sanctity in worshipping the Lord. 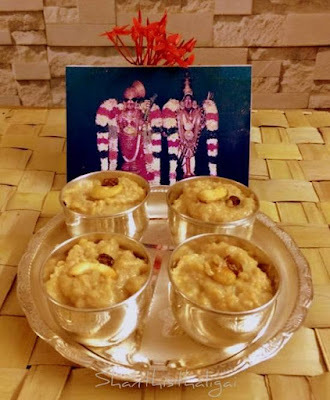 Generally, This "Akkara adisil (அக்கார அடிசில்)" is prepared on the 27th day of margazhi, colloquially known as “Koodarai Valli (கூடாரை வல்லி)” and also on "Aadi pooram (ஆடிப் பூரம்- Andal's birthday) and offered to the Lord. 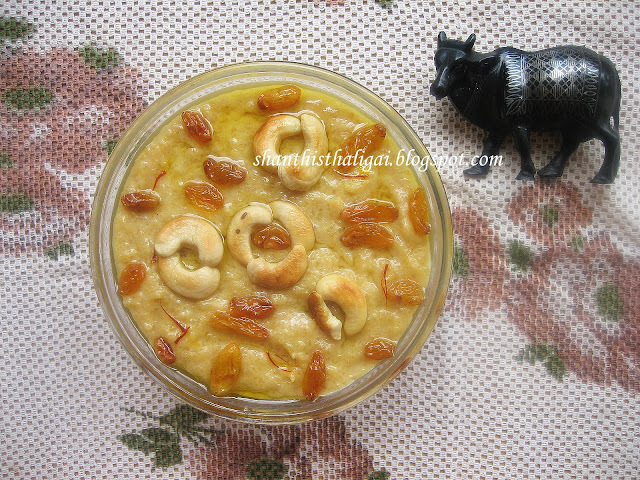 Sakkarai pongal or Akkara adisil can be made as prasadam. Tiruppavai (திருப்பாவை) is a collection of thirty paasurams (பாசுரம்) sung by Sri Andal , in praise of Lord Narayana. In the 2nd Tiruppavai, "Vaiyathu vaazhveergaal (வையத்து வாழ்வீர்காள்)", Andal and her friends start fasting and tells about the fast and the procedures. In the 27th pasuram, "koodarai vellum (கூடாரை வெல்லும்)" she concludes the fast by decorating themselves with ornaments, eating the sweet rice prepared with thick milk and overflowing ghee and singing the praise of Sriman Narayana. Also, in the 27th poem "Koodaraivellum (கூடாரை வெல்லும்)" of "Tiruppavai" Sri Andal says "Mooda nei peidhu muzhangai vazhivaara (மூட நெய் பெய்து முழங்கை வழிவார)", so we prepare the Akkara adisil or Sakkarai pongal with sumptuous ghee. "Koodi irundu kulirndhaelo (கூடி இருந்து குளிர்ந்தேலோ)" meaning share and enjoy the food with everyone. So we pray Sriman Narayana for His blessings to be united and joyful. The akkaravadisal given in temples as prasadam has its own unique taste. Most of the temples celebrate 'Nooru thada utsavam' (நூறு தடா உற்சவம்) - one hundred vessels of Akkara adisil is prepared and offered to the Lord on Koodarai vellum day and on Aadi pooram. Sri Andal in Her NachiyAr Thirumozhi- naaru narum pozhil pasuram ( நாச்சியார் திருமொழி - நாறு நறும்பொழில் பாசுரம்), promised to offer 100 thadaa (தடா- very big vessel) of Akkara adisil and 100 thadaa of butter for Thirumalirumcholai Azhagar, if HE fulfilled Her wish to marry Sri Ranganathar. AZHAGAR granted her wish and SHE merged with Ranganathar even before she could fulfill her vow. Later, Sri Ramanujar fulfilled Her promise and offered hundred thada of Akkara adisil and hundred thada of butter on her behalf, to Thirumaliruncholai Azhagar. Coming to the recipe, as there were enormous cows in "ayarpadi", I have clicked the dish with a cow. Enjoy the IYENGAR FAMOUS AKKARA ADISIL (அக்கார அடிசில்), also known as AKKARAVADISAL (அக்காரவடிசல்). Heat a deep and heavy bottomed vessel (or pressure cooker) and roast the rice dhal mixture till it changes colour and slightly yellow. Now add 1/2 litre of milk and allow it to cook in the milk. ( OR) pressure cook for 4 whistles. When done, mash the rice well. Soak saffron in a tablespoon of hot milk. Crush jaggery, dissolve in very little water, strain out the dust and add it to the mashed rice. Now add 1/2 of the ghee and the remaining milk mix well and stir for a while on stove. The consistency should be semi-solid. Add powdered cardamom, saffron and pachaikarpooram. Add in the remaining ghee. Garnish with fried cashews and kismis. Oh my god.. it looks damn tempting.. yummmmm.. had this in temple today.. was so yummy and now this picture is tempting me tooooo much. looks so nice,I have had this SRC mess,divine taste! The pictures are too very professional! What a beautiful click..looks absolutely yumm. The dish looks so tempting but I have one doubt. Do we have to roast the rice dal mix in ghee or plain as you mention later use the 1/2 ghee. Roast rice and dhal plain, without ghee and later on add ghee. My friend use to make this,have taste.Really an excellent sweet. Hi SE, Akkaram is jaggery in Tamil. Shanthi Maami - akkaravadisal looks sooo good. This is one of the many perks of being Iyengar - you get to eat this many times a year! Usually it does not look so pretty like what you've made it to be! Perfect - I want a hot bowl of this! 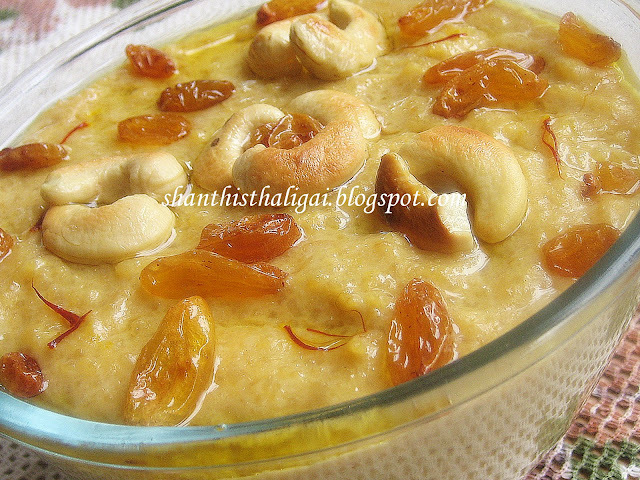 i wish to try this soon..it luks so delicious...u mentioned one litre milk and used half litre??.. mmm. looks sooo tempting and delicious. This dessert looks delicious, I have to try it! I know until then they have been observing the paavai nonbu refusing milk and ghee etc, and on this day they rejoice that the prayers will be heard and want to have something that will drip ghee until your elbow. What better can be than akkarvadisil? Awesome picture for a very favourite dish. I am trying to cut down sweets and this does not help. Quite like Chakara Pongal. great sweet.. :) Seeing this i was reminded of Vasu's Akaravadisal... ;) Was too tempted to eat it and made it right away. :) And ya it turned out great.. Thanks for the recipe..
You are doing a great service to all of us by sharing immense and highly valued knowledge. Thanks a lot ! i am a beginner to cooking, while adding pachai karpooram should i add it directly or dissolve in water and add. i added it directly while doing sarkarai pongal it was not mixing well. Shanthi...I tried it and i must say it tasted divine!!!! Tried this and LOVED it !! Thank you for sharing your lovely traditional recipes with all of us. Please keep up the good work ! !